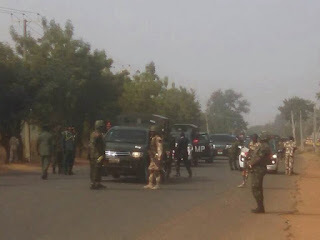 Heavy fighting broke out late Saturday night into the early hours of Sunday, between men of the Nigerian Army and members of the Islamic movement of Nigeria also known as Shi'ite, following the surrounding of the house of leader of the movement, Ibrahim El-Zakzaky, by troops. Following what the Nigeria army described as an assassination attempt on the Chief of Army Staff (COAS), Lieutenant General Tukur Burutai at about noon on Saturday, when his convoy was attacked by the Shiite members, the troops returned to El-Zakzaky’s residence in Gyallesu area of Zaria, at about 11pm. It was gathered that moves by the troops to arrest the leader of the movement were resisted by his members. Residents said heavy gunfire accompanied with chants by members of the movement were heard in the area for over two hours. There were unconfirmed casualties in the attack.